If Nippers are the future, our Youth Surf Life Savers and Open Teams the great chest and wings on which Surf Lifesaving keeps people safe on the beaches and stays aloft in terms of fitness, then our Masters and Senior members are clearly the backbone of our surf lifesaving clubs and all that has been advanced and kept in our Surf Clubs is due to those we still see running rings around many of us at Carnivals and as Custodians whose contributions ensure Surf Lifesaving itself is and always will be. On the east coast of New Zealand at a town called Gisborne. No; when the war broke out, because dad was off to the war, he moved my mother up to Auckland to be close to her parents. He enlisted in the New Zealand Army and spent most of his time at Guadalcanal. We were there until the early 1950’s and then dad, through his work, was transferred to Wellington. I spent my high school years in Wellington and then went to Teacher’s College there too. What grades were you teaching once you qualified? What was the best thing about Wellington for you during this time? It was a cosmopolitan city even then. The Governor General lived there, it was the centre of Parliament, it was a great place to grow up. The Opera House had every show that came out – we had a great time as kids. My husband was transferred. We came to Sydney and started off at Oatley. We found we then outgrew the house and the factory workspace and so moved across to North Sydney and then moved to French’s Forest. We subsequently outgrew that premises too and so moved the business and factory to Terrey Hills. This was a book publishing business. My position in this company could best be described as ‘general rouseabout’. But you also held down an executive position in this company June during an era (1960’s to 1980) when women’s positions in society were quite regulated? I was well aware of the climate at that time and the attitude that ‘a female was useless’. I totally ignored it, did what I had to do and did it to the best that I could do and just kept going. How did you become involved in the Surf Lifesaving movement? My two boys belonged to Wakehurst Ruby Club. Queenscliff Surf Club did a drive through the rugby club. My husband thought this was a great idea so off he and the boys went. Women weren’t involved in the running of the clubs at this stage. When I met Bert (King) I became more involved, taking on a role at Newport Surf Club and then at Branch for seven years on the executive committee. June was Treasurer 1983-84, 1984-85 and 1985-86 and then Secretary 1986-87 and 1987-88. You also put together a Program for running Surf Carnivals for the National Council? Yes, I did that. When I first began in surf lifesaving there was a shortage of people with the skills to put a surf carnival together so it would run to time. There is also a lot to be done prior to running functions such as these; there are permissions that need to be done. What I originally wrote then would have been updated several times since as times change but prior to then there was no structure in place to help organisers successfully implement these carnivals. In the 2011-12 season you were made a Life Member of the Sydney Northern Beaches SLS Branch – how did it feel to receive that? A tremendous honour. I recall several men stating prior to then ‘don’t know what women are doing joining us, they’ll never become Life Members’, so it was good to see women’s role and contribution acknowledged. Digressing from that slightly, I recall my own father, who was a Surf Lifesaver at Napier in New Zealand in the 1920’s, said to me quietly one day when he came over to visit, ‘you don’t tell the men what to do do you?’. That ingrained, anti-women, ‘this is the boys club’ attitude ..‘And you can bring tea and scones’, ‘and run fundraisers for us?’ and that’s all relegating …? Yes; but I can make scones too. (laughs). You have seen the changes come about though from women being excluded to being included – what shifts in the atmosphere of our surf clubs did you most notice? I’m not sure what the system for schools was here but I think when these changed and allowed co-ed’s instead of boys down one end of the suburb and the girls up the other I think this contributed to the change, that boys became used to girls being around. Now we have some mixed events – the relays are mixed. You moved from Queenscliff to Newport SLSC with Bert in..
Women were officially allowed to become members of Surf Life Saving clubs in 1980 – what roles did you take on at Newport? I was Treasurer at Newport – and that’s how I got involved with Branch. They were stuck for a Treasurer and so I was seconded from Newport. I have a book keeping background so this helped – I fulfilled this role for three years and then was Secretary for three years and then was Club Delegate for another year after that. I then felt I’d had enough. You have also been made a Life Member at Newport SLSC? Yes; I went to an Annual General Meeting at the clubhouse and there they all were voting on me! It was absolutely totally unexpected and I felt very honoured because I did work hard but this was just putting my nose down and getting on with it. You never know what is being said behind your back or whether people notice your contribution. You also fulfilled the role of Patrol Captain for Newport SLSC – what does this involve? The Patrol Captain must be totally aware not only of the beach conditions and water conditions on the day, but also the type of crowd that is there and foresee any possible problems. An example of this is visitors to the beach who dress in attire unsuitable for surf water conditions, especially in conditions where the water or tides are changing and changeable. Another example is being aware of children who are going in the water and to make sure that you have got those people inside the flags. The Captain must also have his or her team for the Patrol allocated certain duties for that length of time they are on the beach. Somebody must be in charge of driving the IRB, somebody to go out on the board, somebody to be on the Rescue Tube, somebody dedicated to doing the CPR should that be required. There is a fair amount involved in each Patrol and once again, a structure in place to support those on patrol and those on the beach who may require assistance of they get into trouble. You did your Bronze Medallion under your daughter – how did that feel? That was fun. Because I was over 40 at the time and I wasn’t at all sure that the physical component of it would be achievable. But I did it, just! The physical test involves a run, and you can’t stop. You then swim out to the buoy, which is 400 yards out, then swim back and run again, which is another 200 metres. There is also the theory side of the Bronze Medallion and a theory exam. There is also the Resuscitation that you have to do, and this is required to be renewed each year. When I did the Bronze we didn’t have IRB’s but we did have the reel, line and belt – we had to swim out with the belt and rescue somebody. After you had brought them in you had to demonstrate your CPR – part was passing this through that course but you also had to demonstrate it as part of this procedure. It was daunting, but I got there. My daughter is still doing her patrols and that is 34 years of surf lifesaving service in her case. Did getting the Bronze Medallion as a mature lifesaver encourage you to keep up that level of fitness? I’d always played a fair amount of tennis over the years – that was my physical fitness, that was my exercise. You are still doing a fair amount of exercise – were one of the participants in the World Record seniors Class at Mona Vale and also do Yoga for Seniors – what is involved in this class? The yoga exercises are graded for our ability. It is an hour of exercise though, and I find refreshing and invigorating. That hour a week I thoroughly enjoy – there are a lot of stretches involved and it maintains a fitness for those who do these. What is the best part of Surf Lifesaving for you? The camaraderie would be first and foremost – it also gets you out in the fresh air. We have four generations that have been part of surf lifesaving – my father, my sons, and I now have a granddaughter who is part of the Newport Surf Life saving Racing Academy as well. Jamie is loving it and has plans to be a lifeguard on the beach as soon as she finishes her HSC. 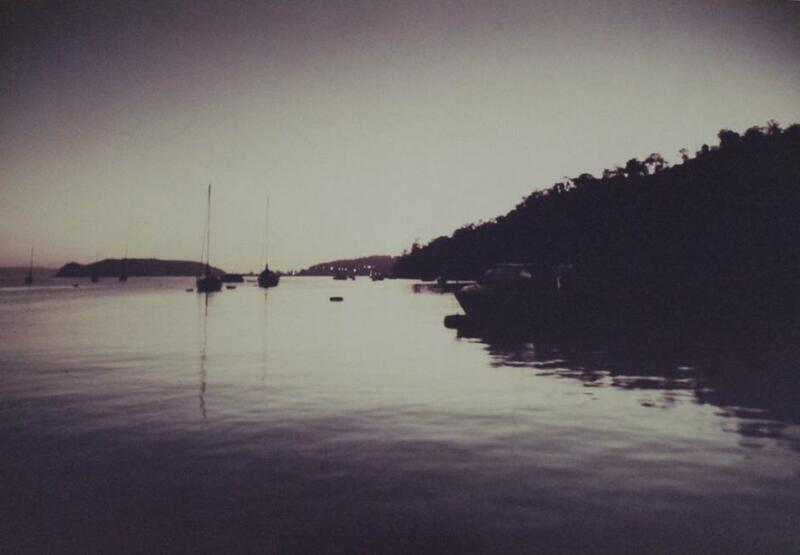 What is your favourite place in Pittwater and why? The Hawkesbury. We had a beautiful old boat and at every opportunity we could get we’d slip out, even if it was overnight, and explored the river from top to bottom. What is you motto for life or a favourite phrase you try to live by? 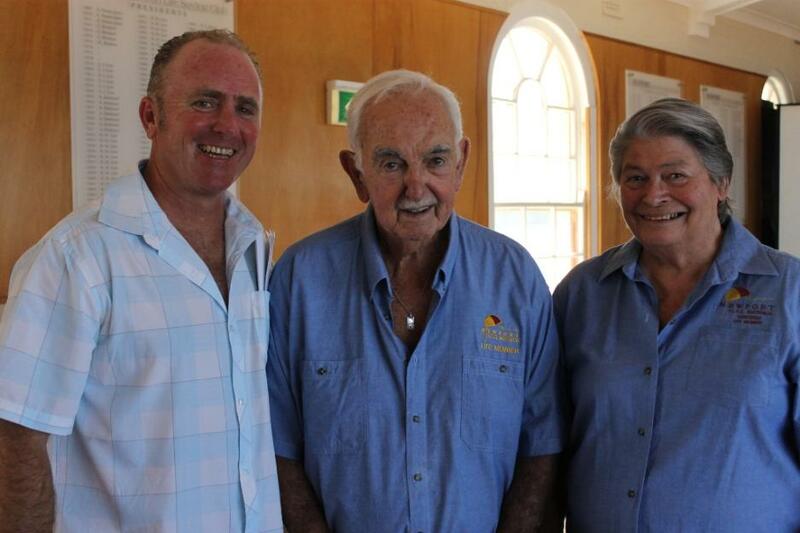 Rob Emerson, former President of Newport SLSC with Bert and June King, July 2013. Photo by A J Guesdon. Bronze Medallion training qualification. To obtain this you must be over the age of 15 and demonstrate proficiency in surf awareness, survival, patrol and rescue procedures, emergency care plus anatomy and physiology. 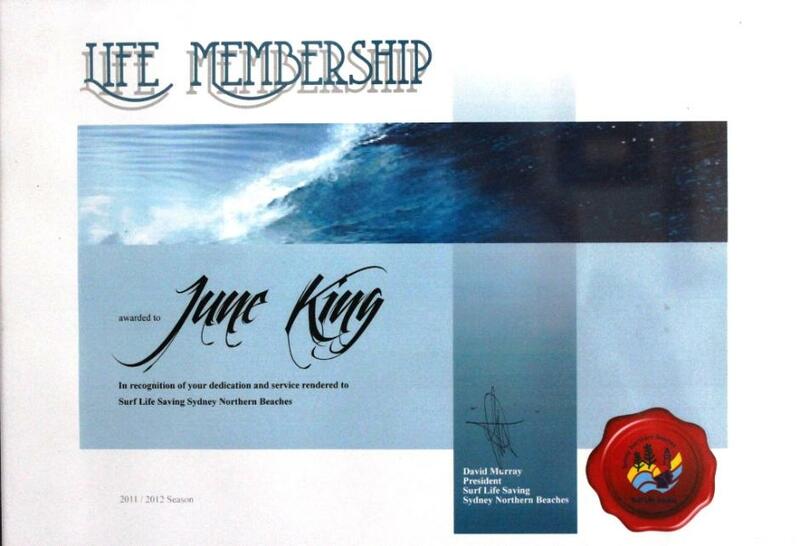 Newport SLSC Life Member June King was recognised for the years of substantial effort to assist Surf Life Saving in our Branch being awarded Life Membership of Sydney Northern Beaches Branch which is a fantastic acknowledgement of June’s tremendous service. How did you meet June? I met June at Queenscliff Surf Club, 1981. She was representing her company which sponsored the Queenscliff Surf Club, it was a carnival. It was the day I got my Life Membership for the Manly Warringah Branch and the President insisted I come to afternoon tea. I said, “Don’t be silly Paul, I’ve got a Boat Area to run.” And I think I had some refereeing to do too that day, or something like that. So I eventually went to ‘afternoon tea’ and I’m looking at boat area and making sure everything is going alright and there was this lovely lady standing there and she had a lovely white what I call an A frame frock on, and a lovely smile on her face, and I thought, hell, that’s nice. So I got the boys to introduce me to her, and I said “are you going to be here after the carnival?” and she said “yes.” And I said, well I’ve got to go down and sort the boats out but after that I’d like to see you and talk to you. I took her out to dinner that night, straight off the beach, feeling scungy and salt laden, unclean and all that sort of thing. But we went out to dinner and we hit it off, and apart from when she had to go to New Zealand when her father was very ill, we’ve been together ever since. I’ve been a very lucky and very fortunate man. June had been involved in Queenscliff as a member but not actively. Paul got June to take on a job as Treasurer and a remark was made loudly; “what’s this; we’ve got someone on the executive that hasn’t got a Bronze Medallion?” So June went and did her Bronze Medallion and her daughter was her instructor. June wrote a program for running the Surf Carnivals for National Council. She also has a Life Membership of the Branch. June: we stopped doing Patrols around about 1991. Bert: June was a Patrol Captain too you see. Bert and June, combined, have done around one hundred years of Patrols. How many sons do you have Bert? I’ve got three and June has two. Five sons between us and one daughter. Four on my side and seven on June’s side. My granddaughter has done very well last year, brought home five silver medals in the Branch championships (SLS SNB). Above photograph taken by Bert King, at dawn, on a day away on their boat with June.